Advertising industry observers opine that the power of the work lies in its success in declaration the brand’s dominance, saying that irrespective of what others might say, the Cadillac-owning populace are leaders in their own right. By saying, “That which is good or great makes itself known, no matter how loud the clamor of denial. That which deserves to live – lives,” the company was essentially telling its prospective buyers that among other things, in a Cadillac, they would rise above all others, despite the naysayers. 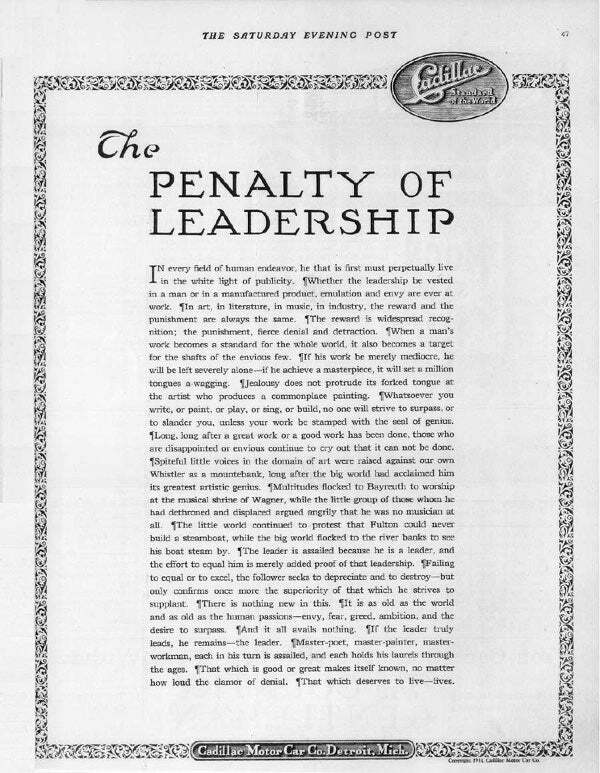 If one had any second thoughts on the impact and popularity of the work, know that besides bagging a slew of industry awards, both Cadillac and the agency MacManus, John & Adams reportedly received requests for a copy of The Penalty of Leadership almost every week in the 30+ years after it was written. Not just that, Elvis Presley, who was a big fan and kept a framed copy in his office at Graceland, is also said to have helped pushed the work into limelight.